When you propose to that perfect someone with the perfect ring, it is a symbol of your desire to spend the rest of your life with that special person. Then you finally get married and put that wedding ring on their finger, it is a symbol of 2 people coming together to create one beautiful life together. When you buy a diamond anniversary ring, it is a symbol of the love that you have for each other and the love that you will always have for years to come. Anniversary rings 101 What is an Anniversary Ring? These bands are given as gifts in celebration and representation for a wedding anniversary. In the United States, engagement rings and wedding bands are always worn on the left ring finger, whereas there are more options in the way that an anniversary ring is worn. They can be worn in combination with the wedding band and engagement ring. They can also be worn on the other hand. It is all up to the preference of the person who will be wearing it. When it comes to the look of an anniversary ring, they are usually a multi-stone ring. They can be made with diamonds or other gemstones like emeralds, pearls, or even various birthstones. They can also be made of different styles, colors, and metals. The anniversary band that you buy should be bought with the wearer in mind (in their preferences for jewelry) and how they are going to wear it (whether as a statement piece or in combination with the wedding or engagement ring). Types Of Bands for Anniversary Rings ID Jewelry Diamond District NY Eternity bands 3-Stone Bands The 3-stone bands were designed to represent yesterday, today, and tomorrow of the couple’s life. They stand for the entirety of their relationship and not just the marriage itself. These bands, most popularly, are made with 3 diamonds on them, but these are not the only type. Some will opt for other stones depending on what the wearer likes. Some are made with various gemstones and even with the birthstones of family members, such as the birthstones of their children. Eternity Bands These are bands that have matching stones, of size, shape, and color that go all the way around the band. Although diamonds are a most popular stone choice for these bands, there are plenty of other stone options as well. This is one of the hottest types of anniversary rings that people consider for their partner. This piece of jewelry is a representation of the eternal love that exists between the couple. What style of band should you get? Anniversary Rings New York Traditionally, a complete 360o uniformly-designed ring is the popular choice, to represent the never-ending circle of eternity. A complete circle of precious stones, perhaps diamonds, or a combination of diamonds and her favorite gemstones. A more modern style anniversary band, on the other hand, is more of a half ring; with stones only visible on the knuckle-side of their finger and precious metal completing the circle. As with any investment, there are pros and cons to both the traditional style band and the more modern half ring. A traditional band may be difficult to resize, should you misjudge the size to start with, or if it needs altering later in life. Both scenarios happen very often. If the stones are too closely set, it will be very difficult for a jeweler to add or replace a piece to make the ring larger or smaller, without adversely affecting its appearance. The pro side is obvious: more precious gems! A half ring, although less precious stones, is still a beautiful complement to your loved one’s engagement and wedding rings. After all, they want to wear it all the time, without having to take it off for reasons of comfort and practicality. Stones Other Than Diamonds Anniversary Rings NYC Diamonds are what most people choose, but they are definitely not the only option. The GIA lists corresponding stones for particular anniversaries: GoldGarnetPearlsBlue TopazSapphireAmethystOnyxTourmalineLapis LazuliDiamond Gold and pearls, you are wondering? Although they are not considered gemstones, they have a well-established tradition when it comes to anniversaries. Gold can be represented as a color, as opposed to golden metal, with stones like citrine, golden South Sea cultured pearls, amber, and yellow sapphire. There are gemstones that the GIA lists for anniversaries up to the 60th. The most important thing to remember when shopping for an anniversary ring is the person who will be wearing it. You want to consider the type of stones that they like if they are going to be wearing it on their dominant hand, and if they are going to be wearing it as a statement piece or in combination with their engagement and wedding ring. As long as you remember to shop for them, you can’t go wrong. Setting A Budget Eternity bands ID Jewelry NY Some married couples never bother with an eternity ring, while for others it represents a significant milestone in a lifelong relationship. Perhaps it is presented to a loved one to recognize a significant anniversary, the birth of a child, or even reconciliation. These are some of the typical reasons for making this symbolic recommitment to each other. When the words, “I truly love you, forever,” just don’t seem to cut it. How much you should pay is really up to you. Of course, it has to be no more than you can realistically afford but should demonstrate the depth of love and commitment you have for the person to whom you are pledging companionship for the rest of your life. Your choice should really be based upon your personal preference and what you think will best suit your partner, rather than the monetary value. As a suggestion, go for a price range between an upper and lower limit–perhaps $2,000 to $4,000, aiming at $3,000. This should allow you freedom of choice, rather than constraining you to a predetermined fixed price. It has to be the right ring rather than the most expensive. Choosing the Perfect Metal The most common metal for engagement, wedding and eternity rings, is yellow gold, which can come in varieties that denote the purity of the gold content. For example, 14 karat gold has 58.3 percent pure gold, with the other metals added to make it harder and more durable. Pure gold is denoted as 24 karats but is considered too soft for everyday wear as jewelry. For a more yellow hue, 18 karat gold has 75 percent pure gold content. It is still suitable for everyday wear but is not quite as durable as 14 karat gold. An even more yellow, even pinkish, gold is rose gold. These yellow golds best suit darker or golden skin-tones. Alternatives to yellow gold are white gold and platinum, which both have a silver appearance, suiting pinker skin-tones. Because platinum is a very hard metal, jewelry can be produced with a purity of 90 or 95 percent. However, the most appropriate eternity ring will usually be chosen to match an existing combination of engagement and wedding rings, thus completing the perfect demonstration of the love and commitment you have vowed to the person you intend to spend the rest of your life with. Investing in an anniversary band is a beautiful way to commemorate the love you share. When shopping, just keep the advice we have talked about above in mind. 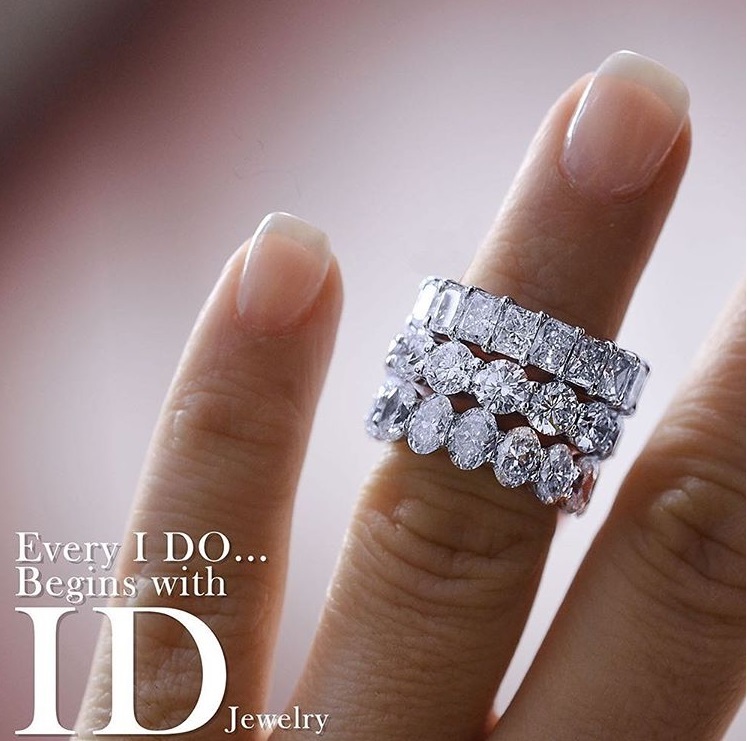 Be sure to start your search at ID Jewelry, as we are experts in this field. Happy Anniversary!